The Steuben Prevention Coalition after receiving grant funding from the Bath Elks Lodge #1547, along with the Quest Youth Group and the St. John Vianney Parish Youth Group, hosted a Youth Retreat for ages 12 – 18 in an effort to provide an opportunity for our youth to listen and engage with each other on the issues in our communities and the resources available to them to combat underage drinking, the prevention of marijuana, opioid and other drug use, suicide prevention and educational awareness on the latest vaping and juuling trends. 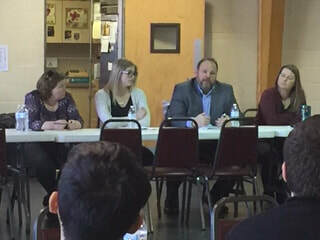 The full day’s line up consisted of participants from the Bath Elk’s Lodge #1547, the Quest Youth Group, the St. John Vianney Parish Youth Group, the Steuben Prevention Coalition, local law enforcement, the Suicide Prevention Coalition, and the Steuben Council on Addictions just to name a few. 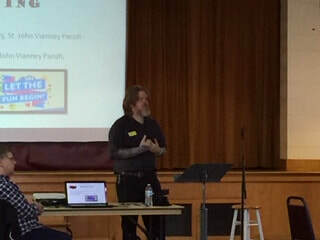 The first of what we hope will be an annual event was held on March 23, 2019, from 9:00 a.m. – 4:00 p.m. at the O’Malley Hall of St. Mary’s Catholic Church, 32 East Morris Street, Bath, New York. Video Contest on the Social Host Law. 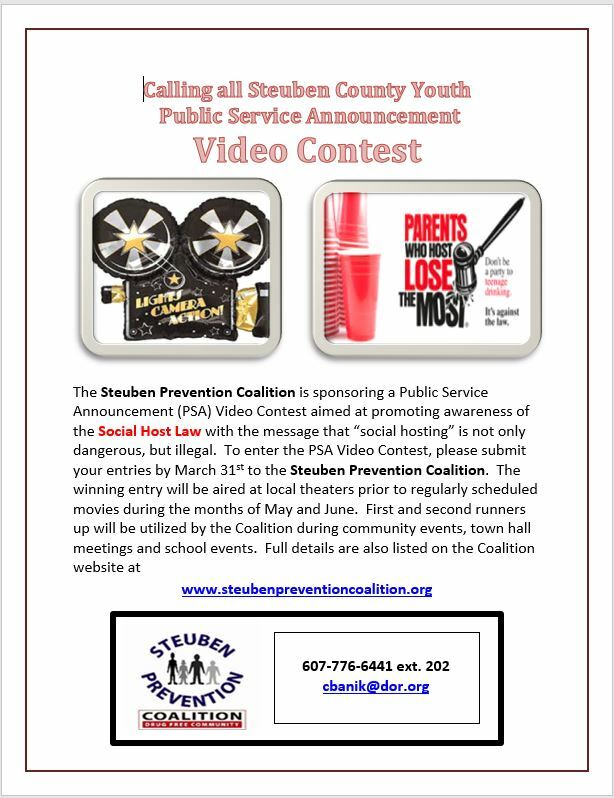 be submitted by March 31, 2019 to the Steuben Prevention Coalition. "Today's Marijuana - How it is Affecting Our Youth"
Stay tuned for future Town Hall Meetings being planned!! 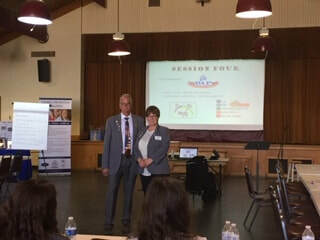 The Steuben Prevention Coalition - Steuben Task Force on Underage Drinking held a Town Hall Meeting on September 27, 2017 @ 6:00 p.m. 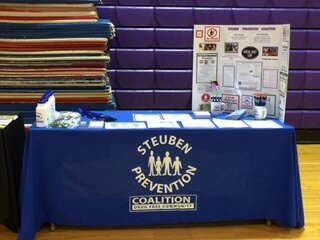 The Steuben Prevention Coalition participated in the Strong Kids Safe Kids of Steuben County event held on September 16, 2017. 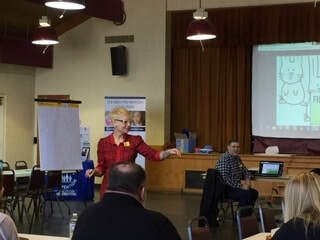 This event was hosted by the Bath-Haverling School District and sponsored by Prevent Child Abuse Steuben, Steuben County Youth Bureau and Tyrtle Beach. This is a collaborative effort of concerned businesses, agencies and individuals who want to make sure that kids simply get the chance to be kids. 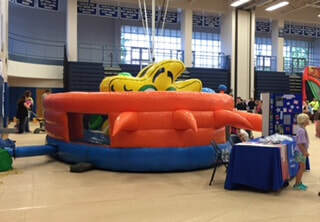 This event was a fun and information filled day for children and their families with education activities and family entertainment all geared to promote awareness of children's health and safety. Please take a few minutes to complete the 2017 Adult Perception Survey. We provide this survey in order to gain a better understanding of the picture adults see as issues and concerns in our communities. This is an anonymous survey and we encourage you to share this link with any other contacts you may have in Steuben County. A full day of activities were planned by a committee put together by Coalition Member, Pam Aini and the Sheriff’s Office STOP DWI program. 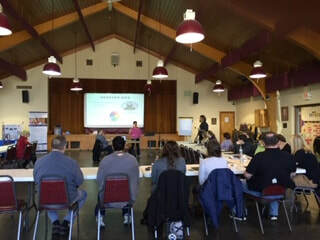 These activities included the “Battle of the Belts” seat belt challenge, an automated go cart challenge, simulated field sobriety testing, demonstrations by the NYS Police Canine Unit as well as numerous coordination and focusing challenges using the Alcohol and Marijuana Goggles. This was a true community effort in prom and graduation safety awareness and many thanks go out to all of our partners who donated time and resources to make these events successful. 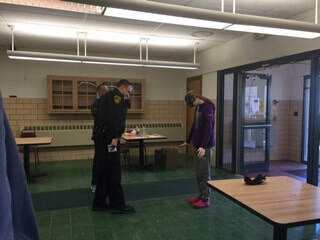 Mock sobriety testing with alcohol and marijuana goggles. Coordination and sight testing with alcohol and marijuana goggles. Coordination and puzzle shape solving with alcohol and marijuana goggles. Reaction testing using simulated driving while under the influence. Canine demonstration of a non-compliant individual. 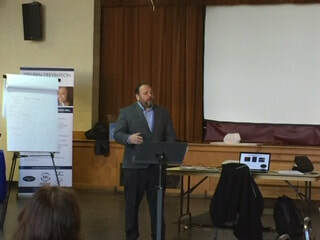 On Wednesday, March 29th, the Steuben Prevention Coalition in partnership with Alfred State College and the Steuben County District Attorney's Office held a very successful Tall Cop Event – High in Plain Sight where approximately 300 educational professionals, law enforcement professionals and community members attended through-out the day’s events. 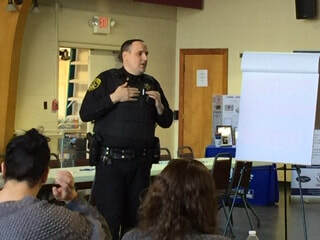 The entire program event consisted of three sessions throughout the day where Officer Jermaine Galloway, also known as the “Tall Cop”, covered alcoholic energy drinks, alcopops, alcohol and drug concealment methods, drug paraphernalia, over-the-counter drugs, e-cigarettes, popular party drugs as well as a teenager’s “mock room” . UPDATE 1/18/18 - Two members of the Coalition have attended the 2018 CADCA National Leadership Forum from February 5th - February 8th. Stay tuned for all the exciting and informative details that they bring back to our Coalition and put into action!!! 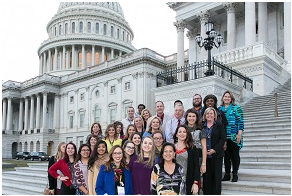 Coalition representatives recently participated (2017) in the CADCA National Leadership Forum in Washington, DC. 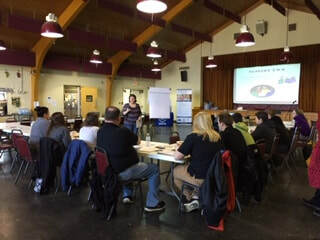 to learn new skills to increase substance abuse prevention efforts. 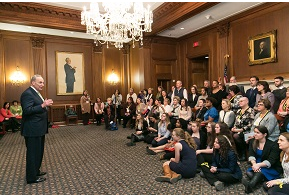 CADCA's Forum covered a wide range of topics from how to prevent prescription drug abuse and the abuse of synthetic drugs and marijuana to how to create tobacco-free environments and develop policies to reduce underage drinking. Coalition representatives also heard from several federal leaders through out the week as well as congressional and senatorial members during Capitol Hill Day with a record breaking 320 appointments held this year on Capitol Hill where the message was successfully brought to our representatives. 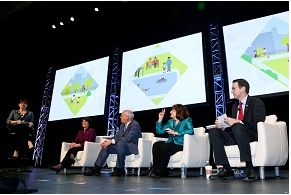 CADCA's National Leadership Forum is the nation's largest training event for community prevention leaders, treatment professionals and researchers. 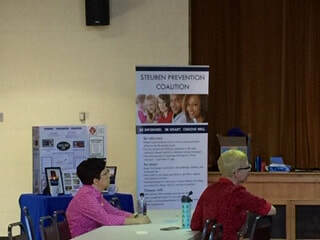 The Steuben Prevention Coalition participated along with Community members, law enforcement, and recovering addicts in the first Community Opioid and Substance Abuse Forum on February 9, 2017 at the Haverling High School in Bath and on May 9, 2017 at the Hornell High School in Hornell. A 3rd event was held on October 24th at the Corning High Painted Post East High School from 6:00 - 7:30 p.m. 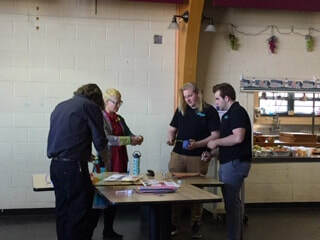 In Bath approximately 100 people attended the discussion at Haverling High School to both learn about the issues facing the community and ask questions about how they can help loved ones who may be suffering. For the full story and video provided by mytwintiers.com at the link below. 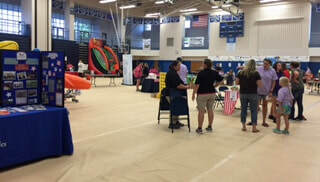 The Family Fling Night at the Glenn Curtiss Elementary School was a fun and exciting event. 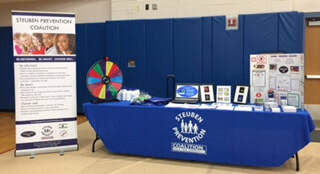 The Steuben Prevention Coalition and the Steuben Council on Addictions participated with activities for the youth and their families together with providing valuable information and prizes for participation.